Sports Clips, Inc. is a new chain business in Durango that provides haircuts specifically for men. My first haircut there was good enough to where I’d recommend that other men go there, as well. Sport Clips, Inc is now my favorite place for a haircut in Durango. They’re not exactly a barber shop, but the lady who cut my hair had gone to school for cosmetology, which was just as helpful. At their new store I wasn’t wanting a shave from a straight razor, anyhow, just a tapered hair cut. What I got was their New Client Adult MVP haircut. My stylist was very articulate in asking for my preferences in length, whether to use a buzzer or scissors, and whether the length felt right to me when running my fingers through it. Good communication! She probably spent ten minutes cutting my hair to perfection. Afterwards, the MVP treatment meant that she brings me into this back room where there’s four reclined chairs with articulating foot rests. I sit back in my chair where my neck lies into this custom cradle with a towel in it, while my head hangs into the wash sink. She put a warm wet towel around my face, leaving a hole for me to breath through, and delicately massaged my head and face. Then she washed my hair, and gave me a towel to dry off with. Taking me back in the hair-styling room, she applied this tea tree oil moisturizer to my hair, which felt and smelt fantastic. All of this happened in about twenty minutes, and I was thoroughly satisfied with my haircut. This Sport Clips receipt copy has a different MVP price quote than the one given to me by an employee over the phone. At the register, a lady handed me a receipt for my free MVP haircut experience as a new client. It showed that my free experience was discounted $18 dollars. In contrast with this receipt showing a New Client MVP haircut to be $18 dollars was the information I got from a lady at the store during a follow-up phone call to ask about their rates for haircuts. She explained that a Varsity Cut, which just includes the cut, is $18 dollars for returning clients, while a MVP haircut with a hair wash in a vibrating chair to be $23 dollars. The reason for the pricing discrepancy? I’ll let my readers decide that. Despite the pricing discrepancy, I’d still go back to Sport Clips for a haircut when I’m wanting a fast, well-done haircut that makes me look and feel comfortable. After recently submitting three barber reviews to BuzzTown’s online business review section, my positive review of Luca Salon got published, but my two negative reviews of other barbers were rejected. This should come as no surprise to anyone who checks out a handful of random reviews on their website, of which, most are chearleading rants, with many positive reviews submitted anonymously, and many submitted by the staff of BuzzTown itself. BuzzTown sent me emails stating that my reviews were not approved because they did not comply with BuzzTown Review Policy. Instead of relying on a marketing entity (BuzzTown) that’s got a conflict of interest in publishing negative customer reviews of companies that they are paid to do marketing for, I’m just going to submit these bad reviews on my blog, so that this nonsense censorship can end immediately. To start, let me tell you about my experience at Tucson’s Barber shop. Amador Tucson, the owner, cut my hair there twice, with satisfactory results. Of great annoyance to me, however, was his practice of talking on the phone with his wife for almost the entire duration of the hair cut on both occasions that I visited him. For that reason I’ll only give him one star and recommend that nobody else bother letting *HIM* cut their hair. Amador Tucson gave me a decent haircut here while talking on the phone almost the entire time–on two separate occasions. I certainly don’t have to give his business any more than one star just because someone more competent might work there who could do a better job at cutting my hair. This cheap haircut lived up to the reputation of you getting what you pay for. ONE STAR OUT OF FIVE! 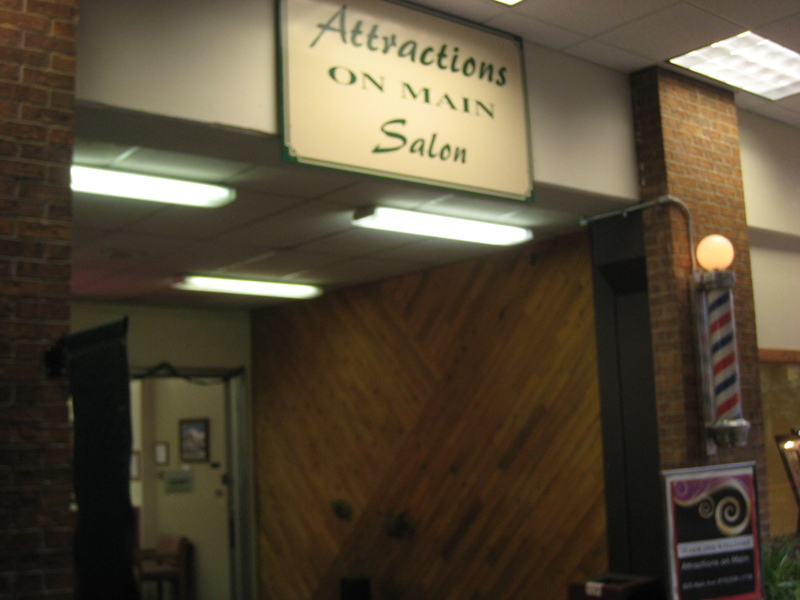 Merv Bergal gave me a good haircut the first time I went to Attractions on Main. He was gentle, gave me a good taper, and had some engaging conversation with me. His coworker Tony Barela, however, did a much worse job upon my second visit to Attractions on Main. Barela was really rough and clumsy with his hands. He was not gentle with me. He ran his comb across my scalp so hard that I wrenched in pain. I told him that he could probably be more gentle with his comb. For a brief minute he was gentle, but then went back to jabbing the comb into my scalp with his lack of finesse. It really hurt. He also attempted to give me the entire haircut with me facing away from the mirror on the wall right behind me. I corrected this by physically turning the chair and holding it in place so that I could watch him as he cut my hair to make sure something terrible wasn’t happening. It was a scary experience because I truly thought he was going to butcher my haircut. He would run his hand across my scalp between cuts–clumsily over my ears–bending them in the process, as if my head was a piece of corn that he was shucking. In the end, the haircut Barela gave me was marginal, but the experience was discomforting. For how painful this haircut was, I recommend against anyone visiting Tony Barela for a haircut. TWO STARS OUT OF FIVE!